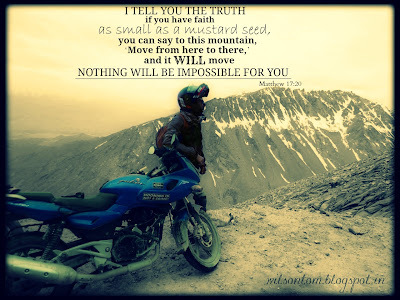 After a gap of 1 year I had my Motorcycle road trip. 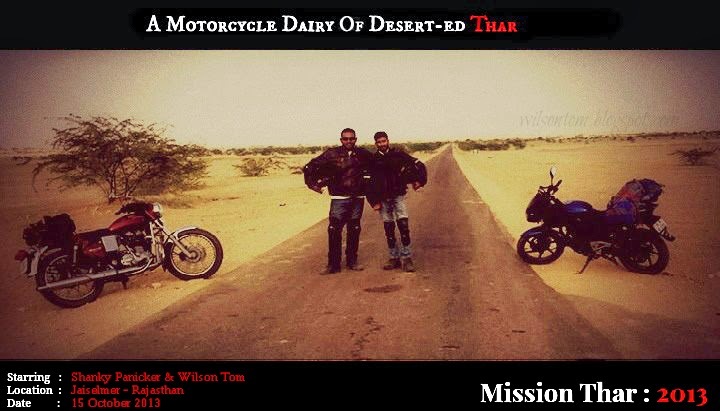 This time my mission was to explore The Thar desert, in Rajasthan with my best buddy Shanky. Everything was according to our plan, all the equipments and a necessary things was arranged and we were ready for our trip. We were supposed to sleep early but our friend Mr. Rahul Gambhir, who is very p-u-n-t-u-a-l and has been awarded many times for his punctuality in the form of swears and abuses, helped us to be up till 2 O Clock. Subsequently, we finished packing and chatting by around 2’o’clock and then slept till 6:30 am, as opposed to our plan of sleeping early and start the trip at 4 am. But, whatever happens…..happens for good. After dropping Rahul at Vasant Kunj Bus Stop, our journey started. Time 7’o’clock. 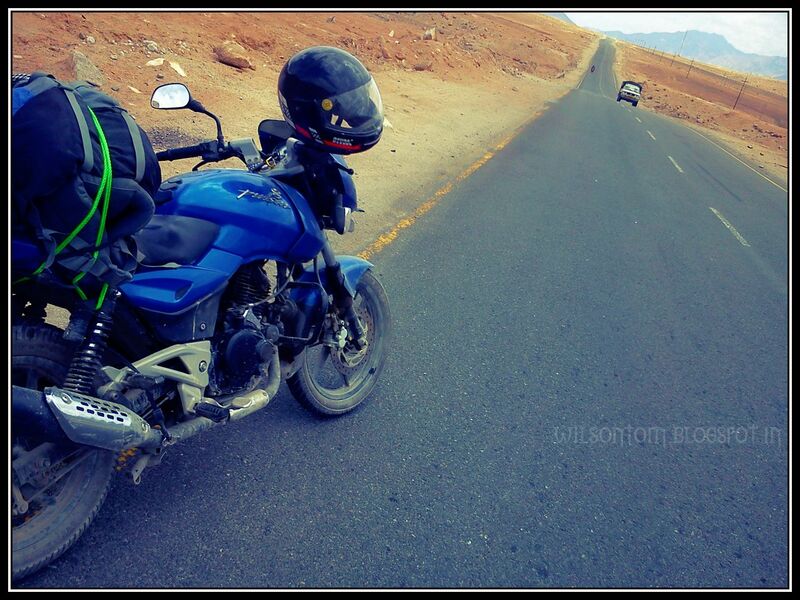 Our adrenaline was pumping up, as soon we crossed Gurgaon toll. Excitement was gushing as RPMs were rising. Enroute Rewari and Ateli our first stop was at Narnaul, around 150 kms, where we had our breakfast. Here we took a little more time as Shanky’s luggage was creating problem, so we had to reinstall it. In all my trips, the first halt that we take we rest for a good amount of time, whatever the reason may be, but after the first halt we got a good speed and consistency. 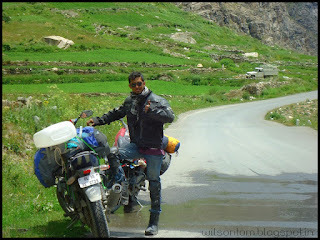 After the breakfast we left for Jhunjunu, where in between Shanky took a wrong turn and we both went solo for a while. Due to the crowded Gol-Chakar (roundabout) at Singhana, Shanky crossed me and I couldn’t see it. I was driving slowly on the correct track when one of the locals asked me if I was looking for an Enfield wala….yahi se bhagate huay legaya hai . Just then Shanky called me and said he reached around 35 Kms further at Chidawa. I was surprised in just few minutes he rode 20 miles!!!! I didn’t waste my time started my bike and gave the accelerator to the end. The road was really amazingly clean straight road with very less traffic, and then I realized how he fired (after all it was a BULLET aswell) the 20 miles in few minutes. I wanted to stop for a while and explore the beauty of that beautiful road, with blossomed Sunflower both side of the road. The panorama of that particular stretch of road was simply incredible, but I couldn’t stop and took pics as I was in a hurry to catch-up Shanky at Chidwa. By around 7 PM, somehow we managed to reach Benisar. After the sun-set this was the only place we found a dhaba. We were very much tiered and hungry. We had our stuff parantha’s and soon after finished the dinner we left to Bikaner. By around 10 PM we reached Bikaner, where at the very starting itself we found one of our listed hotel which we already had chose : Vijay Camel Man Guest House, we entered and checked the rooms and after a slight negotiation we managed to get the AC Room for Rs.1ooo. Both of us were really tiered after finishing all formalities we checked into our room and dozed off ASAP. After getting fresh up and having our tea, we checked out and geared-up for Karni Matha temple, around 25 Kms from Daislok. Usually this temple is isolated and very few people visits but due to the Dusshera time lots of devotees were visiting the famous Karni Matha Rat temple. I was eager to explore the Rat temple. As our luggage was tugged on our bikes, removing it and visiting the temple would’ve wasted a lot of time. So we decided that one of us will go inside the temple, if it is worth visiting then next one also will go. So I went to the famous Karni Matha rat temple. We have to remove our shoes to enter the temple. And for camera, they will charge 20 Rs. As soon as you enter the main gate you will start seeing rat running here and there. When I put my 4th step one rat passed through my feet and I jumped off, took a snap, and went back. It was enough for me; I didn’t have the go further. 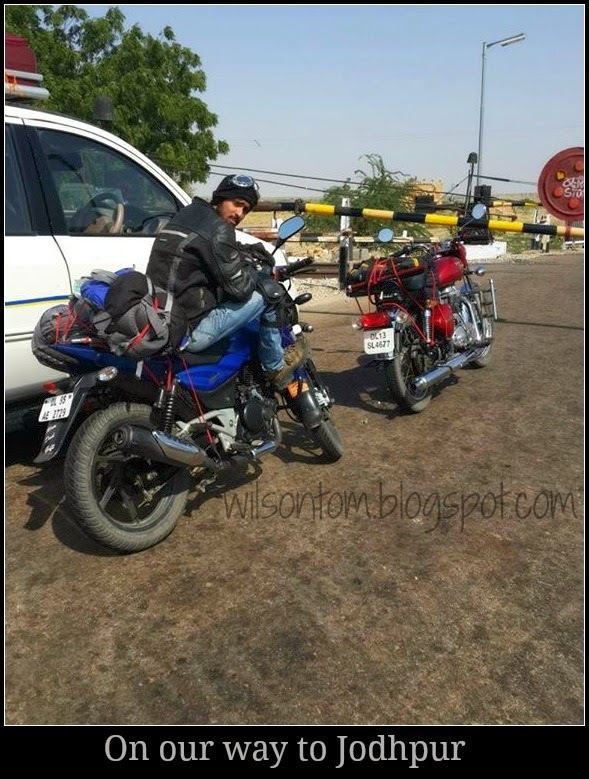 Then we started our journey to Jaiselmer, for which we had to cross Bikaner again. Somewere near Kanji Ki Sird, we stopped for lunch. The foods prepared by the Rajasthani’s are amazing, initially I thought that the food won’t be as good as Punjab’s but I was wrong. Marwari cuisine was also great; here we had a Makki ki Roti, with amazing Dal fry, and Panner Burji. Here people don’t use much oil and ghee. Clean, healthy, natural food is what you get mostly. In the afternoon when sun is at its best, on top of our head, it was really hot, and also as we were all geared up with our armor and jackets we were more exhausted. While riding we don’t feel that hot, but as you stop you feel the heat with the gear and the jacket on. In this trip, what we commonly found unusual was that the locals were so surprised to see us, as if we were some aliens; never seen before. Where ever we stopped, people came to us, asked us where we were going, where we came from, why we are going and checked out our armour and stuff…… so for us it was a bit like a celebrity kind of affair! We felt very proud as we were receiving so much attention; very different from my Ladakh trip where it was a common sight to see geared up bikers on trips. One thing I learned from my celebrity experience here is that these locals can eat a lot of your time while halting; which can mismanage your trip schedules. One simple solution; tell them that you’re a student, that cuts off a lot of questions. The NH15 is a highway which should be renamed or regarded as a “Runway”. 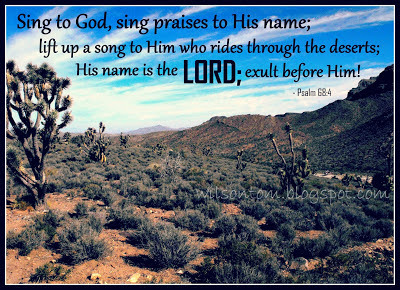 Riding on it is like a heavenly experience. One can test his bike’s top speed very easily. With the road looking clear till the horizon and the excellent condition it is, I just fell in love riding on this road. But with the romance comes the ugly reality that one may fall asleep(less possible on 2 wheeler) easily. So we took frequent breaks to revitalize ourselves by having tang & glucose directly without H2O. By around 7 PM we reached Jaisalmer and as we were about to enter the city, we were chased by a lot of hotel touts chasing us as it was lean season. But we were not happy with their options and moved ahead for a while. After checking our hotel options list we reached Hotel Tokyo Palace; good enough and close to the Golden fort as we required. The hotel was absolutely worth staying for Rs.1200, AC room with twin bed and all modern amenities along with swimming pool facilities. Early morning we got up and got ready for Jaisalmer sightseeing. At the street market we had some amazing snaky breakfast of Mirch Pakorda & Kachori; literally a mouthwatering experience, delicious hot Jalebi as sweet dish. Next, we visit the Mandhir Palace for which the entry cost Rs.60 and for Camera Rs.30; the entry fee was being used for the maintenance of the Palace and of the family and also was paid to the Government. The palace was not up to that mark; it’s a heritage palace which is still being preserved by the Maharaja’s family and the great grandson is taking care. Later we went to Golden Fort, i.e., Jaisalmer Fort. Inside the palace it was more like a citadel full of shops and guest houses. We were allowed to take our bike inside the fort and so we had our sightseeing in bike. 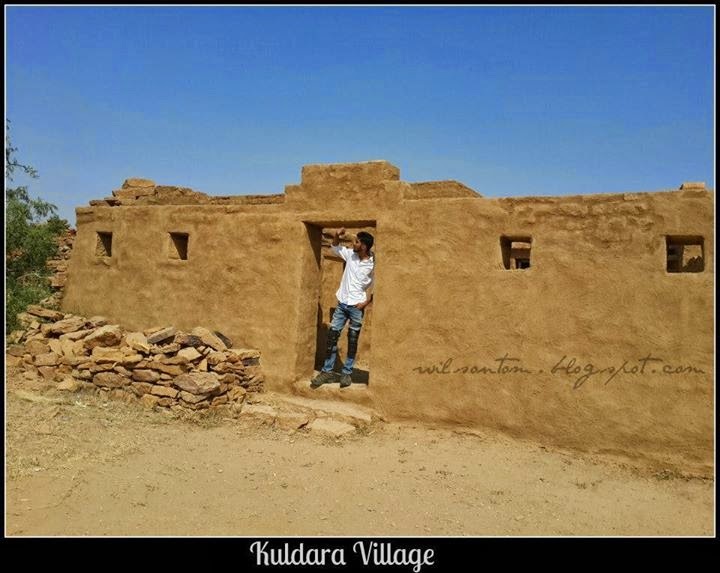 Later we came back to the hotel and checked out from there and left for Sam Desert, enroute visited Kuldara Village. At Sam you will find lots of Resorts and tents. We didn’t make any booking in advance but enquired about the rate. When we reached there and after a lot of bargaining we got one tent from Mehar adventure Camp for Rs.1000 Per head which included night stay dinner, Camel safari, breakfast and traditional Rajasthani cultural Show. At dinner we experienced the amazing Rajasthani thali which included Dal-Bhati, gate ki sabji, aaloo ki sabji, Kher Shangri, Rice, roti and at the end as desert Surma. The accommodation part was not that good as the tent had no fan and had a lot of mosquitoes singing around our ears and feasting on our blood. After the whole day’s ride we didn’t get a good sleep as the mosquito problem was getting worse; ; even Odomos didn’t stand a fight. Finally, I decided to take the mattress outside the tent and it was quite breezy and dozed off in no time. Early morning the Odomos and the dew started to feel quite sticky and I suddenly realized that I was sleeping outside the tent….in the desert. I started shivering and went inside the tent; remembered geography taught in school about desert type of climate, hot during day and cold at night! Early morning we got ready and had our breakfast. Later we left Sam and drove towards Jodhpur. Enroute we stopped near Pokran at a dhaba to recharge ourselves. While having chach we were chatting with the Dhaba owner and some others about a very distinctive observation that we 2 bachelors from Delhi observed; we couldn’t find much girls outside and most of them were not quite beautiful (no offence to anyone; just a personal thought) as compared to Delhi, but they argued that there are lots of beautiful girls as well but they don’t get out of home, or if they get out they cover their faces. Later we drove and stopped somewhere 50 Kms before Jodhpur, where we experienced delicious Sev tamatar Ki sabji with Roti, and around 6’Oclock we reached Jodhpur. After searching for hotels we got at last a guest house near to clock tower. Sarvar Guest house which was an average guest house with homely atmosphere. Normally Jodhpur hotels are expensive, so the convenient place to stay is at a good guest house which will be economical as well hospitable. And if the guest house is located in the main city then you can experience the culture and lifestyle of Jodhur very closely. Early morning we visited Mehrangarh fort then Mandore garden, enroute had some juice and after checking out from the guest house drove towards Ajmer by around 2’o’clock; enroute we crossed a village named Bar, where we saw the beautiful sunset from the highway; it was really panoramic. From Bar to Ajmer, the road was awesome, like heavenly experience but due to the sunset and darkness we were not able to explore the place very well. 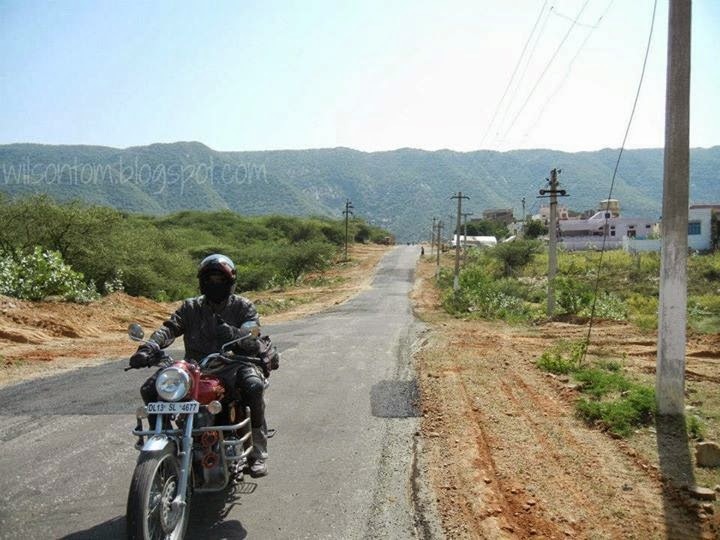 After reaching Ajmer, I decided not to stay here rather head towards Pushkar as Ajmer didn’t have much to see. So we moved ahead, enroute we searched for typical Ajmeri dhaba where we could have good non vegetarian dinner, but we were not able to spot any. So we decided to have dinner in Pushkar itself and by around 9:30 PM we reach and got a room at Hotel Sun-Set. The Hotel was average, but its restaurant was at an amazing location facing the lake side and they had some very good collection of music’s which added more peace to the ambience. After check in we had our dinner at the lake side restaurant with the music playing behind us and the lake in front, clear twinkling sky above, cool breezy climate as it was a valley; both of us were appreciating the fact that we didn’t plan to stay in Ajmer for the night! I didn’t know Pushkar was so amazingggg! Next day morning we had our Pushkar city visit and temple tour. We decided to have street food as breakfast so we had chai with Pava & Dal Pakwan which cost just 50 bucks for two. It was delicious aswell as cheap. After some shopping we checked-out from the hotel and left to Jaipur. In between at Dudu we stopped for have our lunch and around 3 O clock we reached Jaipur. We checked in at a Boutique hotel named Chitra Khata, for which we were charged Rs.600. After freshened up we got ready for our Jaipur sightseeing but by that time the forts were closed so we went to Chowki Dhani to have our dinner. When we reached found huge crowd there, among some people like us were thinking weather to go in or not. Yes, one will think twice before entering it to have thali which starts from Rs.500. We were like OMG when saw the price. 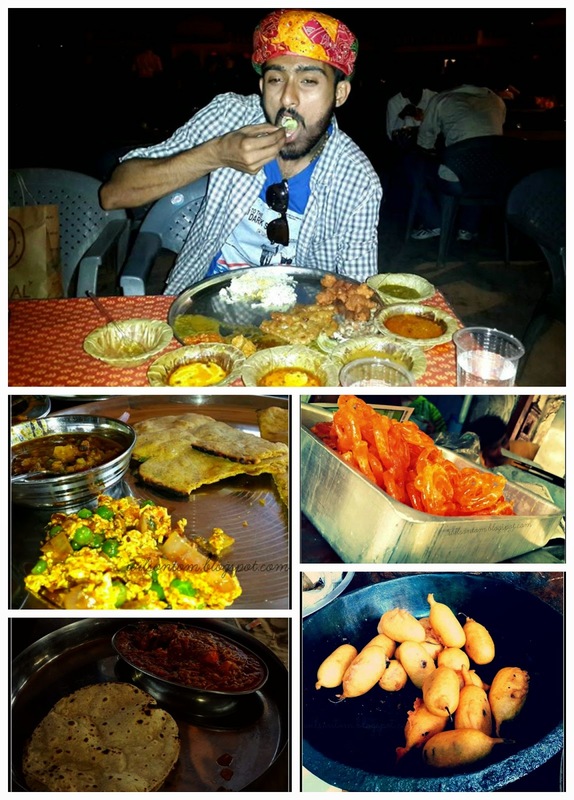 So we had no option rather choosing at least that basic thali of 500 and get into that complex. Inside it’s like a mela in a village; there are lots of things like small games, handicrafts, theme parks, etc. but we first concentrated on our Rs. 500 thali and had as much as we can so as to get the worth of the price. No doubt the Thali was amazing and so was the hospitality of the waiters who were serving. Next day morning we had our Jaipur sightseeing of Amber Fort, Naragarh fort, Junagarh fort, Pana meena ka kund and by afternoon we had checked out and had our lunch on the highway itself. By around 4 O clock we left Jaipur and as we were getting closer to Delhi our excitement started degrading as thoughts of going to office, getting back to routine, same old crowded roads, crawled into our minds. The week long amazing trip was going to end, as we were getting close to Gurgaon; traffic was increasing and as we crossed the Gurgaon toll by around 11’o’clock I don’t know from where, but fireworks lit up the sky like a grand welcome. As it was late and we were starving, we thought of having dinner so went to KFC at Priya, but Only McD was opeded so had some burger and went to home. Reach home by around 12! And the beautiful trip came to an END. As always I don’t wanted to stay at home at New Year eve. 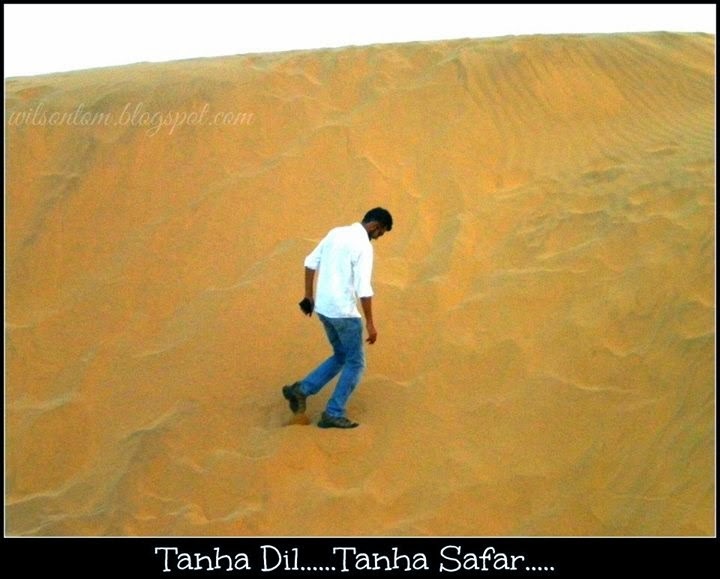 So I started planning for have a trip to somewhere away from Delhi. Hills has become a part of my life as well as my trip. 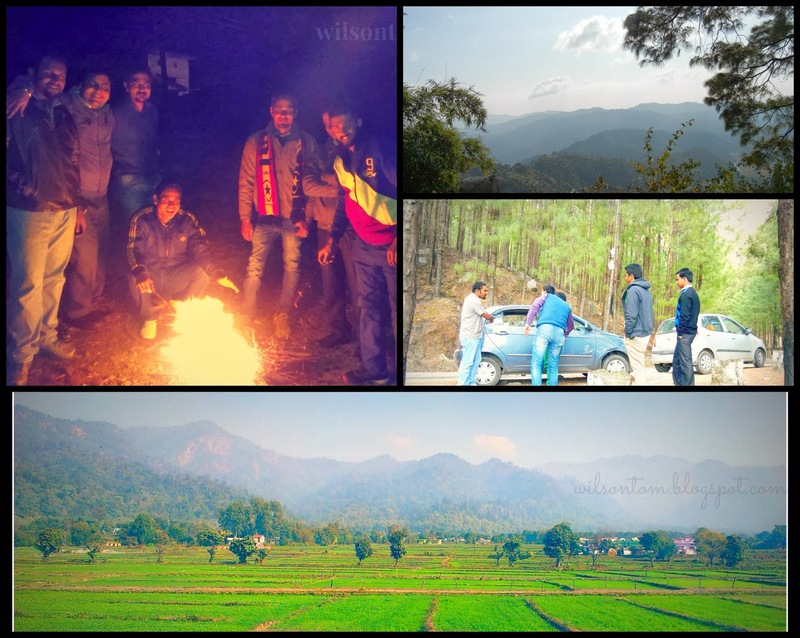 And to my list of nearest unexplored hill station Lansdowne come to my mind. One of my old colleague and friend Rohit was inviting me to visit its hometown at Kotwar at Uttrakhand for long time, but due to some personal and official engagement I could make it. But this time I decided to visit his place, which is near to Lansdowne. So I asked him about the details and planned to visit this New Year along with my other friends to Lansdowne. As always at the beginning there were many friends who wanted to come along with us, but some backed out at last moment and some new faces joined. Before the d-day we created a group in watsapp and started updating about the trip. We were total 8 friends in 2 cars. on 31se December after finishing our works and taking half day by around 3 O clock we all gathered at Shanky’s place and by around 4 O clock we startd our journey to Uttakhand (UK). After crossing Merrut we took break at Mawana and had some refreshments. Because we left for Lansdowne very late so everywhere was dark night without even a single street light. Meanwhile our manual GPS (Rohit), who was supposed to tell us the route and was very confident as well as visited his hometown very often, could guide us. And for that we all from the starting till the end of the trip were pulling his leg. And in many places where we had to take turn we were going ahead and had lost our way. But somehow with Google Map we managed to reach but was little late as per our plan. As 31st was a Tuesday some of them were having Fasting, thus were not able to drink or have non veg, so all were waiting to end this year and so that to start a new year, a new day, a new beginning. 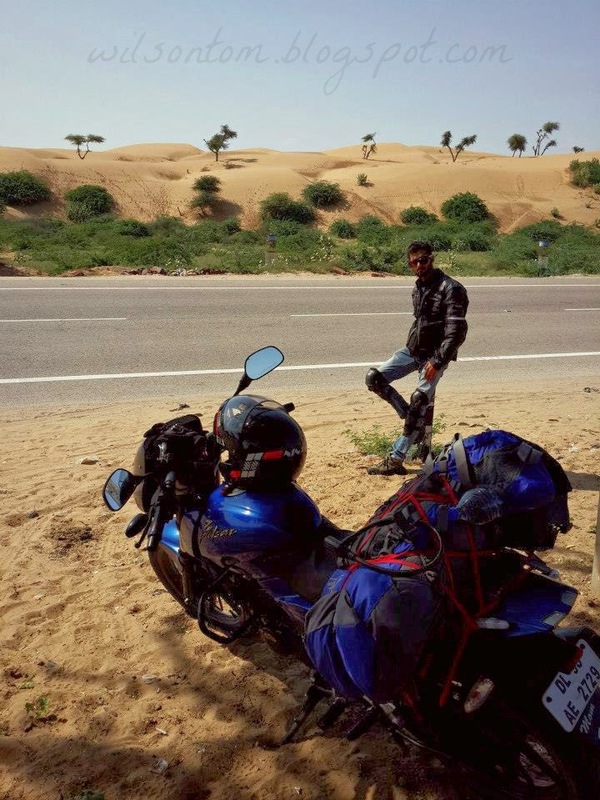 But Sandeep lost his control and while we halted for dinner get the bottle and started making drinks, Fun was all around and the best part was that the roads were amazing well paved hilly terrain with some nice curves. We reached at Kotdwara, which is also regarded as the Gateway of Garwal, at 11pm. And soon we kept our luggages at the lodge in Durgapur. Later we decided to go to the jungle for bonfire. While going to Karnashram ( the Jungle area) we realized the it was raining whole day so woods will be wet, so enroute we saw some bunches of woods we grabbed it and took with us. At the beginning it was not burning but somehow while pouring whiskey and trying hard we managed to burn the flame and bonfire was done just before the 0000 hrs. So started enjoying with the cool weather under the bonfire while having some good foods which Rohits friend managed to packed for us and with booze we welcomed the newyear in united. We celebrated there for almost 2:30 and went back to the Lodge for some quick nap. Morning we went to Kishanpur Rohit’s home were we had our breakfast and the hospitality of his parents was really amazing and lovable. The most amazing thing we found was the location of Rohits house, which was simply astonishing. While sitting at the room itself you will get a very amazing view of lush green farm land and afterwards the mighty hills, which have a n heavenly atmosphere all around the home. After spending some time there we left for Lansdowne. Uttarakhand is one of the sacred places of India located on the foothills of Himalayas, which has lots of different hesitations among which Lansdowne is less known to everyone. But it’s a quite good hill station not so far from Delhi. Lansdowne is a cantonment area which is very neat and clean, having a little colonial touch in the ambiance. The Popular things to explore here is couple of magnificent churches, peaceful ambiance, lush greenery, cool climate and some amazing pine forests. While exploring this place you can’t miss militants and this place is very much famous for its Garwal Rifles. Morning time you may see the march of military people and sometimes you may also hear sound of gunshots. By afternoon we had our lunch at the market in Lansdowne afterwards we left to Delhi. We were a bit late so we in hurry to get back home and at Meerut we had our dinner with some omelets and snacks. And by around midnight we were all back home safe and back to our routine job in with a new beginning of hope. 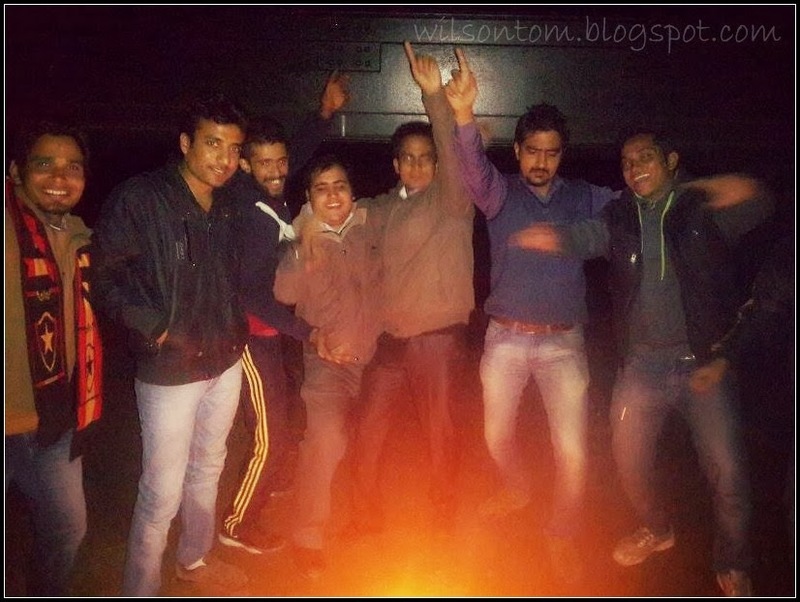 Celebrating New Year in dark big jungle was not less than doing something crazy but we did that. Beautiful songs, awesome climate, running water from the mountains, delicious chicken and glass of drinks what else we could wish at that period of time, it was truly awesome, and here starts a beginning of New Year 2014, with some resolution which are always made to brake. 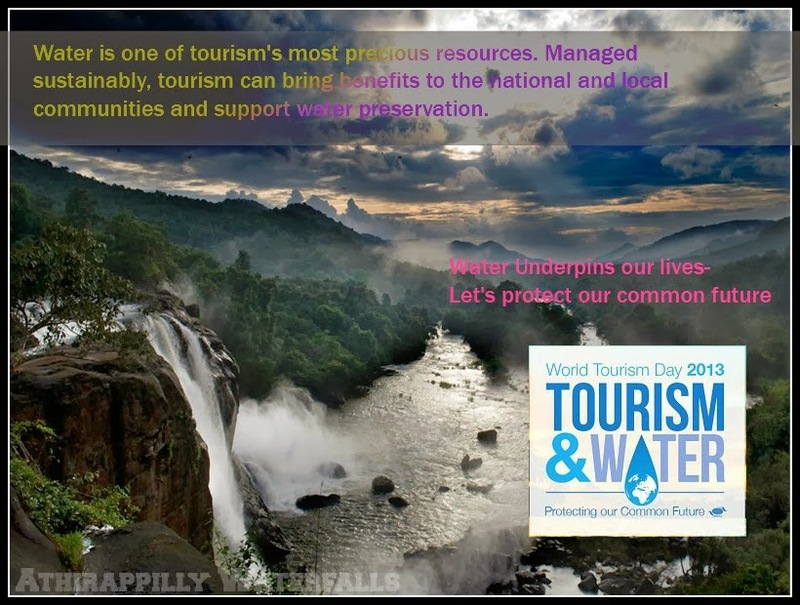 World Tourism Day of 2013 which is to be celebrated and absorbed by people from across the globe on 27th of September is celebrated under a theme ‘Tourism and Water: Protecting Our Common Future’. The official celebrations of this year WTD will take place in Maldives, and the theme will mainly focus on water access and the actions presently taken by the sector sequentially to contribute to an additional sustainable water prospect along with confront forward. The main focus this year is on saving the vital resource of water that is needed by all of us. Targeted at making certain of the tourism sector's part to protect the water resources, this year celebration of WTD in Maldives will comprise a High-Level Think Tank which will fetch jointly civic and personal tourism stakeholders and water specialists to create rules and tactics. Recognizing the vital and crucial importance of tourists and tourism all across the globe, it is an observance by UN and is not a civic holiday. The day is specially aimed at the international community to promote consciousness tourism and its various aspects of socio, economical, cultural and political magnitude. The Secretary-general of UNWTO sends out message to all the universal public to mark the event. The theme for each year stands different like for example: the host for 2009 was Ghana and the theme was ‘Tourism-Celebrating Diversity’. Tourism has become one of the perfect sources of income for many developing countries which are developing along with the increasing number of tourists in the country. Several competitions take place including tourism areas presentation, photos promoting tourism etc. Among others are the discount entries or special or free entries of tourism place according to their interest. Various government, leaders or business representatives of travel companies may also announce publicly about special tours to promote both of their region and World Tourism Day at once. People working on several tourist organizations have a top interest on this day, as it marks the vital importance of tourism on the same day. Tourism is one of the fastest growing industries throughout the world; the dynamics of tourism has developed many places which are now keen places of interests for tourists. Tourism has aided a lot to many countries in bringing up the socio-economy of the country. As a part of the celebration Manipur Tourism forum will be organizing competition and certain activities at the Loktak Lake surrounding Area like : Photography Competition, Local Boat Racing by Bishnupur District Canoeing and Kayaking Association, Manipur Tourism Forum in association of MMTA wills also organizing a one day Water Adventure activities camp. Individual and groups will have the opportunity to experience water adventure activities like water Skiing, water Zorbing, Air Boat etc. ‎ In late September of 1979, UNWTO determined to organize World Tourism Day which was initially celebrated on September 27, 1980. The birthday of the implementation of the UNWTO Statutes on September 27, 1970 was taken as the date for World Tourism Day owing to the fact. As the dates come at the time of ending the high tourist season in the northern hemisphere and commence the tourist season of the southern hemisphere, the UNWTO supposed it to be a suitable date. Clean and reachable water is very much needed for tourism which largely depends on water from restaurants, hotels, transportation to leisure activities. After the busy schedule now am back to my desk, In front of my computer with my daily office work and back to normal routine life. Now all that fun, entertainment, travelling, watching movies, functions, hangouts all have come to an end. It was really hard to come back to the routine life as I was enjoying each and every moment of my life last month. 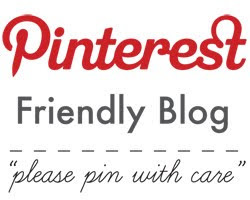 Am sorry for not to be regular to my blogging friends. It was my sister’s marriage, that’s why I got busy. Marriage was at Hyderabad, but for that we had to go to Kerala where engagement was supposed to happen. As we had enough time for preparation, everything was in its full swing for past 1 month. 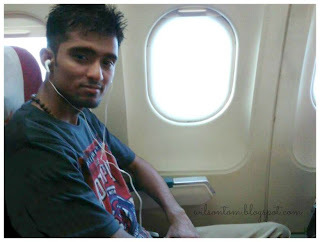 On July 4th itself after all our shopping and purchases we flied to Kochi International Airport. We got to meet Mr. Joseph (Ajith) the groom form the matrimonial site www.chaithanya.in a site only for Knanaya chatholic community. We are Knanaya community also known as Tekkumbhagar, are an endogenous group in the Saint Thomas Christian community of Kerala, India. The Knanaya Community traces its origin back to a Jewish-Christian immigrant community. They migrated from Southern Mesopotamia to the Malabar Coast of Kodungalloor in AD 345 under the leadership of an enterprising merchant Knai Thomman. They were welcomed by Cheraman Perumal, then king, and were given permission to settle down in Kodungalloor. Later, Cheraman Perumal bestowed them with 72 royal privileges. These privileges are very important since all these privileges had influenced the community’s social life as well as the social status in the past years, and are been still followed. As the Engagement ceremony was on 11th July and we had only 1 week remaining all have to be arranged and these day we were totally busy visiting relatives and inviting everyone. As I told Knanaya ceremonies and special, the most important one is Marriage among which pre marriage ceremony that is Mylanchi (for bride) and ChandamCharthu (for groom) is most special. And we were busy for the preparation of Mylanchi. Mylanchi supposed to have one day prior to the Marriage, but due to the lack of time and convenience we decided to do it just after the engagement ceremony. Engagement or Betrothal was held at St.Marys Forone Church Kidangoor, for that groom’s sister has to grab hand and take bride from home, after that only members of bride are allowed to enter the church. After the blessing and Kaipidutham –a Ceremony by blessing the hands of the uncles of bride & bride groom by the priest. And some small prayer the engagement ceremony was over and after photo session we left to the Mylanchi venue: The Parish Hall of St. Marys Forone Church Kidangoor. It was a grand event, as all the relatives and friends participated and everyone had lots of fun. Mylanchi Ideel ceremony is actually beautification of the palms and feet of bride by the leaves from “Mylanchi” shrub on the eve of marriage. After everyone seated the Mylanchi ideel started, and as a mind-blowing bashing entry we took Anuchechy (my sister) in Dholi / Pallak (in old time the mode in which princess was carried). With the song “Mehandi Lagake Rakhna, Dholi Sajakke Rakhna we entered the hall in full bollywood style, which was really innovative and fabulous – as everyone was saying so. With lighting the Koluvilakku (oil Lamp) the My-lanchi Ideel ceremony started. Mylanchi is been put by aunty (father's sister) before that mat are been placed then white sheets are being speeded meanwhile choir people sings traditional wedding songs. Then comes Icha-Pad-Kodukkal – Ceremony of giving sweet pudding to the bride by Appapan (Father's Brothers). And with handing over Koyikal (Chicken Leg piece) to the grooms ammavan (mothers brother) he eats and share it with the fellow people who come to attend the ceremony after that only meals where allowed to provide. While having the dinner there was several entertaining programmes like dances and Shingarimellam done by our relatives. And at the end the Nada villi (cheers) which had added spicy to the event. After Betrothal we have no much time as we have to go to Hyderabad for marriage on 20th July. Some went through flight and some in train and all reached there one day prior. For all a guest house of Arch Diaoses of Hyderabad was booked at Secundrabad. The Marriage was held in St. Mary’s De Sales Church, Shantinagar. And reception at Brindavan Garden at Malkajgiri, it was a huge ground and huge number of people attended the party. 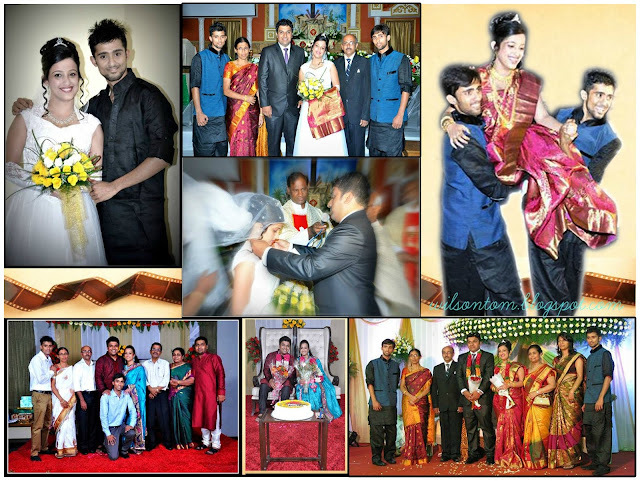 The newly wedded couples were entering with our traditional Nada villi – Cheers saying NaDa NaDaayeeeee….NaDa NaDa NaDa. Then welcomed them by Nellum Neerum – Sign of cross done using the blessed palm leaves (from Palm Sunday) wetted in the paddy (rice) water, on the forehead of Jeeju (In North India Sister’s Husband is call'd as Jeeja Ji – Now officially I can call him so) & Anu Didi - Wishing them God’s blessing and happiness by grooms mother. After that both cut the cake and lighted the lamp. Here also we had rituals like: Vazhu Pidutham – The rite of giving God’s blessing to bride and groom by the mother of the bride by placing her hands in the form of a cross on their heads. Then Kacha Thazhukal – A ceremony using a new piece of cloth given to bride’s relatives as a gift by the groom’s party done by brother (Usually done by Mothers Brother, but in his absence bride’s Brother had done it here) and by aunts. After that Aunty give them both Milk; for a sweet start to a new beginning. Later after the ceremony we went to send off our sister to her new family where mom handed Anuchechy to Jeeju’s mom's hand and me and my brother grab Jeeju’s hand and took him along with us (just as a gesture) then next day itself we all went back to Kerala and we had to visit certain relatives place, as that is also a custom that after marriage they have to visit there dear and near ones house and also certain Churches, for offering at church A small amount of money is given to the bride’s party by the groom’s people. While I was in Kerala this time often went for movie for the Second show. 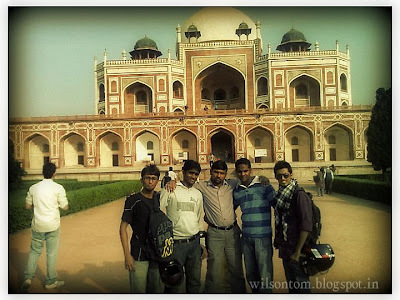 The same week we had to come back Delhi as on 27th we had planned to had reception party in Delhi. So as I told we were literally busy traveling throughout this month: First from Delhi to Kerala, then Kerala to Hyderabad, after that back to Kerala, then at last Delhi, everywhere we were totally busy with loaded activities and functions. After the reception was over then only we all took an easy breath. As this was the first marriage been done in our family as dad and mom where the eldest from both their side, so the rate of nervousness and tension was little bit high. But the help and support from entire family members, friends, and relatives with their prayer & with the presence and with the grace of almighty God everything was nice and ended perfectly. For the hangover we needed certain more time and after all the engagements and works have been done, joined back my office and resumed my routine life. 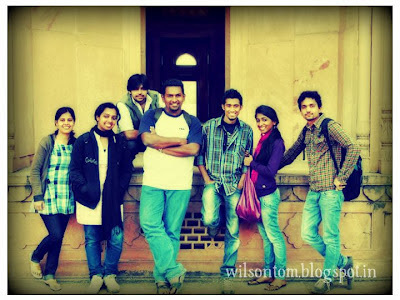 And here starts my first blog after a long interval, hoping to be more regular.